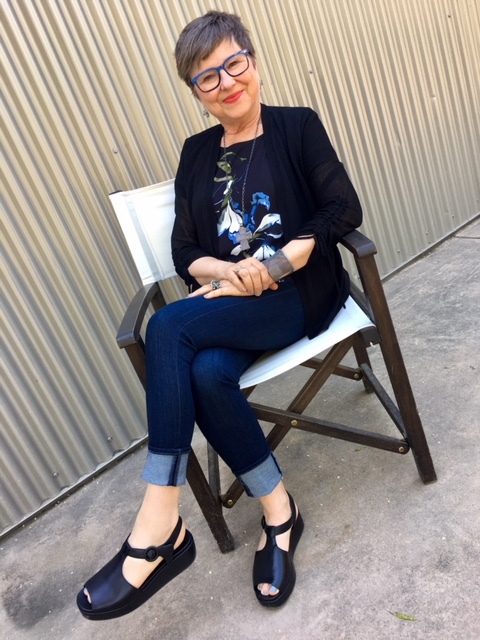 This is Brenda Kinsel coming to you live from WNB, Why-Not-Beauty, here in sunny Sonoma, California. Today’s Why-Not-Beauty Report is a public service announcement to alert you, the public, about something that’s so not beautiful. I know most days I’m bringing you reports of beauty in clothing, accessories, and style expressions, but today we must deal with this issue that’s as pesky as a live mosquito buzzing around your head while you’re trying to sleep. 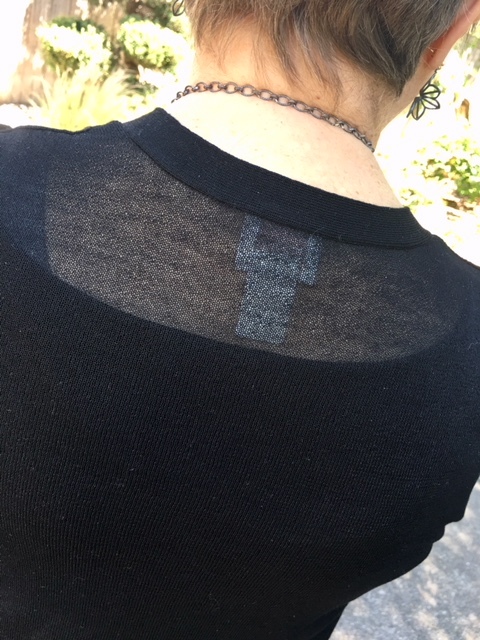 I’m talking about labels sewn inside clothing that are visible through sheer fabrics. What a way to destroy the line of a perfectly grand piece of clothing. Who wants to see that unbecoming label? Nobody! They’re easy to locate. They’re always at the back of the neck and in the left side seam of the garment. 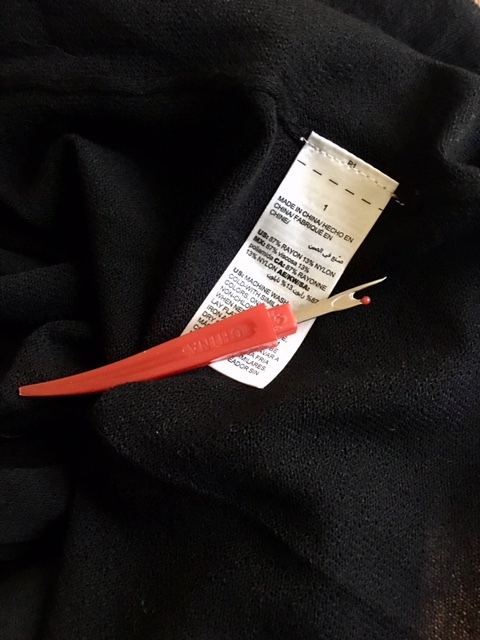 That side seam tag can be as long as the receipt from Staples Office Supplies when you purchase a pack of pens. It goes on forever! Label? What label? Oh, that white thing? We’re heading toward summer. Our weatherwoman, Regina, is a little wishy-washy about it but she’s been suggesting we may not need our cashmere sweaters much this week except for the evenings. I know what she’s implying. She thinks you’re going to be in and out of layers over the next many weeks, taking sweaters on and then taking them off, on/off, on/off. I think she’s right. That puts us right in the middle of white label season. There’s nothing to fear, folks. There’s no sneezing, coughing, or itchy eyes attached to white label season. And it’s easy to treat. There’s a small surgical procedure that will only take a couple of minutes to perform. No doctor’s office, no waiting rooms, no anesthesia; however, it involves a sharp object so don’t do it near children, pets, or mates. All that’s required is a small tool called a seam ripper. You purchase this tool at a fabric store or your local drugstore, maybe even the grocery store (but not Whole Foods). Or shop for it in the Cloud and it’ll be delivered in a box on your doorstep tomorrow. Just to be fair, manufacturers aren’t trying to be annoying. It’s just that their government-imposed regulations require them to let you know how to care for a garment once it’s home and in your possession. They also tell you where it was made and everything you’d ever want to know about the fibers used to make it. The store takes care responsibility while it’s under their roof but once you walk out with it, the responsibility falls on your shoulders. I hear you, dear friends of beauty. We can’t just have beauty without function and those labels are functional. So here’s what I do. 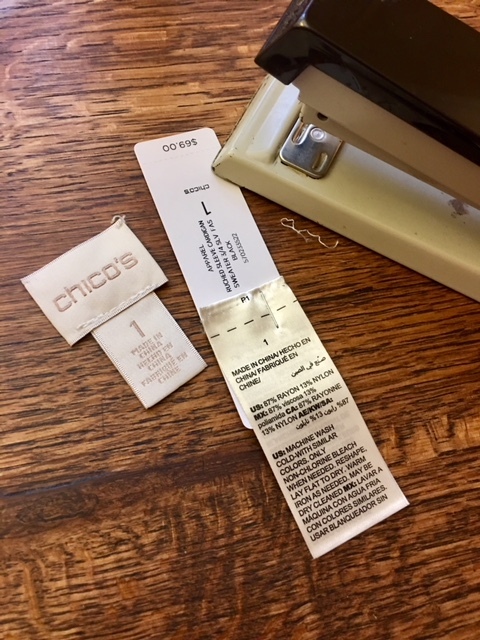 As soon as I remove the white labels I staple the care instructions to the hang tag description of the garment. This way I remember what it goes with. If there isn’t a hang tag I’ll write on the label, in permanent ink, the name of the garment. Then I file the white label in my white label bird dish. When I need a reminder, I pull off the lid of the bird dish, find the appropriate tag and follow the instructions. Then I put the lid back on the bird dish and enjoy its beauty. There you have it! A cure for white label season. I’ve enjoyed our time together here at Why-Not-Beauty and look forward to speaking with you again soon! A final post-production note: I carry a seam ripper with me to every client closet appointment because there’s always a tag or two to dispose of. My clients love that service! What do you do with your labels? Pretend they’re not there? I know it’s tempting. Do you have your own technique for addressing care instructions? Do share!! Where did I put that last thought? Love, love, love your white label bird dish! Thanks so much, Cynthia! It’s feeling really happy right now because all of you are talking about it! I remove my labels also. Sometimes I remove them from opaque clothing if their touch bothers me (which happens often). 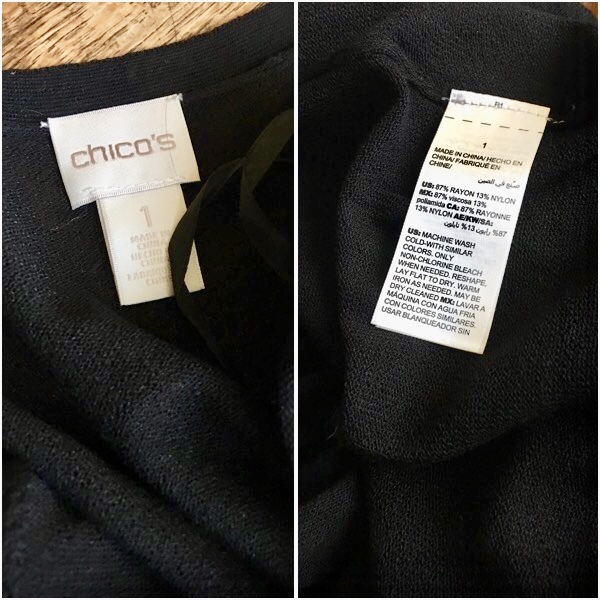 I have found in some items (usually lower priced options) the tags are sewn INTO the seams. Then I just cut closely with scissors. I have, however, taken seams apart, removed the tags, and then restitched the seam. Linda, I’ve done the same thing! I’ve opened the seam to get that rascal tag out. The other grievance I have is when they sew labels into scarves and use teeny, tiny, stitches. It makes it nearly impossible to get out. When the scarves have labels that are loosely stitched in, it’s a cinch. 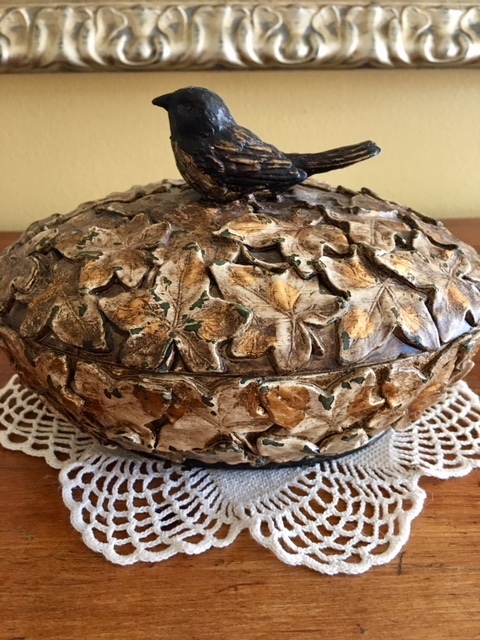 I love your bird dish and this post! Thank you so much! And yes, adore the bird dish. We all want one. Yes, we do have those ribbon loops! Sometimes they’re in plastic. That’s oh so attractive as well (NOT!). I love your message: free your garments! So happy for all this bird dish love! I wish I had a garage full of them to pass them out! PS, love your new specs BK, the ‘new blue’ – I noticed a few designer frames in my local opticians in this new blue colour today! These “new specs” are new again after wearing them for what seemed like months in a row about two years ago. They were my first toe dip into wearing a colored frame. My red frames are my latest ones, again color! I’m getting braver. And I have seen other blue frames around too. I do a lot of eyeglass frame shopping with my clients and there have been a lot of blue ones in the stores. I remember when these blue ones seemed so bright. But I’ve seen brighter and I think I could be tempted again! This is a fantastic idea but…if you consign your clothing it’s much harder to sell if you don’t have a label. People want to know what they are getting. Any ideas? 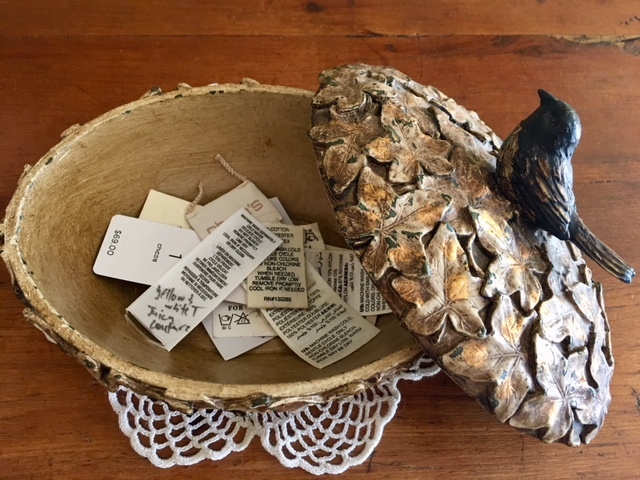 In another pretty dish, you could save those labels with a note about what it came from in case you forget–like Lanvin jacket, Stella McCartney dress, etc. It’s like you’re storing them until and if you need or want to resell them. I totally agree with this article! It brings to mind my son always ripping out the tags inside his T-shirt’s when he was growing up. He ruined a lot of T-shirt’s from doing this. What I realize now is that it probably came from his autism. But then again, I dislike those pesky things too, so, who knows. I love the manufacturers that now print their labels on the inside. I bet he really hated the feeling just like we do. Always fun to hear from you, Sandi! I love this idea, especially the beautiful dish you keep them in. Now I’m off to my closet to see what I can find. Great tips! Will the resale shop accept the item with its label detached? If you have items that you think would sell better at a resale shop when you’re done gently loving them, I’d save the labels and reattach before you take it to the consignment store. Especially on designer clothes, the name in the label has some pull. Love your bird dish and your sandals! If a clothing item has exotic care instructions, I probably wouldn’t buy it. So then I’d just get to enjoy the beauty of the bird dish, not the practicality as well. I have a few sweaters that have fussy care instructions but I just dry clean them instead. Now I must find a pretty dish as pleasing as that bird dish! Can’t wait to hear what dish you’ll find! I was with a colleague when I found this one. It was years ago and I treasure it so much! What I didn’t admit in the blog post but I’ll tell you is that at the very bottom of the dish I have a lock of my mother’s hair. So that dish always reminds me of my dear mother. I’ve been taking a seam ripper to my labels for years, but I love the bird dish, and the idea of attaching the label to the hang tag. I need to up my game. Thank you for saving me from label disorganization. I feel incredibly honored to have saved you from label disorganization. Have fun finding your version of the bird dish! Where can I purchase your cute shoes? Well, a client just emailed me today that at http://www.camper.com you can order them and they’re having a big sale right now. I’m headed to that web page in just a few minutes myself! Excellent advice, Diane. I have come across people wearing their items that way and wondered if I should say something. When I’m with my clients, of course I always do. I have often taken a nail clipper and cut that X out that way when I don’t have a scissor on me. Technically, you could even use your teeth but you didn’t hear it from me. It’s such an easy thread to break. Thanks, Diane! 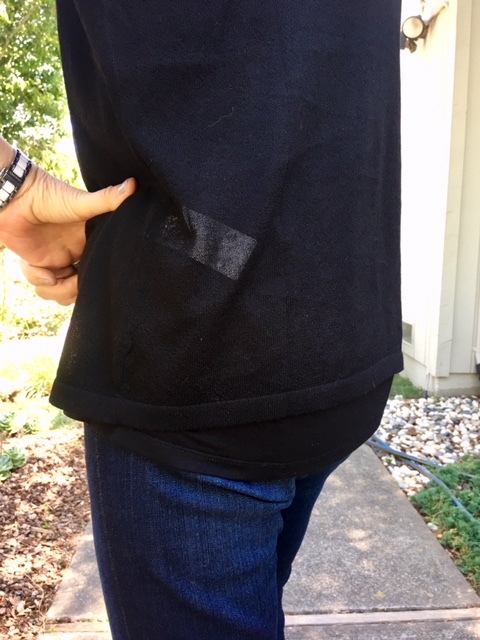 To me, the worst are labels sewn into the actual seams of scarves, that even if you cut them as closely as possible, then have the remnant of the label still showing. This drives me nuts!!! Any suggestions? This also drives me ridiculously nuts. What I have done is after cutting it as closely as I can, I take a permanent magic marker in the color closest to the scarf and cover the remaining white label. It at least makes it fade away a bit. Unfortunately, labels are required by law. I know this since I sew and sell items. We are required to have fiber content, care labels, where the item was manufactured, and if fabric was purchase outside of USA, then that has to be disclosed. Some labels are so ridiculously long because it is labeled in more than one language. There are many more requirements when it comes to items for children. I like the tag-less undergarments and t-shirts, but it is all on there. I know what you’re saying is true. It’s the law! Golly, didn’t realize that about the items for children. And on another but related subject, congrats and sewing and selling items. LOVE it! Gotta love the labels of some European-made clothes that run to pages because of the number of languages printed on them. There’s no way of ignoring those! Yep I’m in the same camp here in New Zealand. Always removing labels from scarves and see through items. But my biggest gripe goes to scratchy labels!. You know the ones…. they look fancy dancy but are in reality the biggest pain in the posterior! Yes, indeed! And it’s so uncool to be wiggling around trying to get skin away from the scratchy parts. I sigh with delight when I’ve removed the labels and all is well. I can be comfortable and never think about it again. My mom use to get soooo annoyed with me always removing labels. I always found them either annoying or itchy, or both. Frankly, once a garment is in my wardrobe I don’t care who the manufacturer was and as far as care instructions do, I do something similar to you: I take a photo of the item and attach the care tag or take a photo of the care tag also. Now you’ve got the perfect 2018 way of documenting the care. I only took the photo for the purposes of the showing what I do but hey, we could just take a photo! I like it! I’m in total agreement about removing labels and especially those ribbons sewn in the shoulders to, I think, hang up the garment. But really does anyone ever use them? They always end up sticking out of the neck or sleeves. That’s the first thing I do when I bring something home is get out my scissors and off they go! Great topic today…. love your humour! Laurice gives us the reason to keep them and it’s on a case by case basis. Otherwise I too cut them out. They always fall out in areas they’re not wanted!! Thanks for sharing! I put the labels in a small (snack size) ziploc baggy. Then I use my hole puncher and punch a hole in one corner of the baggy. If the garment is on a hanger, the baggy goes over the hanger hook. If the item is folded, the baggy goes inside the neck of the item. I generally include an index card that has notes about the garment–for example, jewelry that works with it, when it was last washed/drycleaned…anything I might want to remember. Judy, you’re my kind of clothes wearer! Love all the care you’re putting into your clothes. Brilliant! 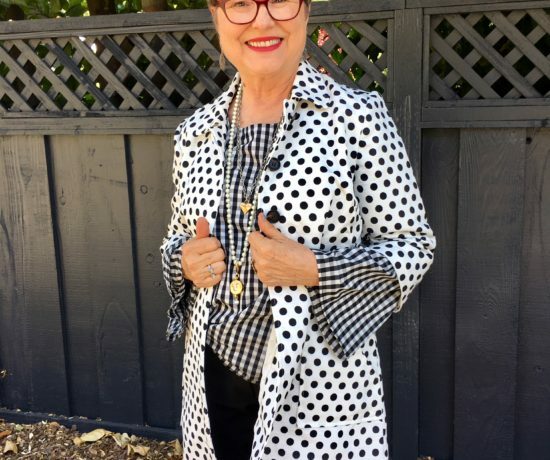 I bought that top by Vince Camuto back in February when I was hosting all these stylists/image consultant professionals here in Sonoma. I have a program called the Monthly Marketing Bundle program and these are ladies that are members of that group. I ghost write content for them to use in their newsletters, webinars, presentations and such. Well, as it turned out we had incredibly hot weather during that week they were here. When I looked in my closet at all my cashmere I knew I had to go shopping quick to have something cooler to wear. So I bought that top which I just loved because it was a floral top and I’d been lusting for it. And do you know that it stayed so cold after that that I am only now wearing it again but with a sweater because it’s not that hot! Not sure you wanted all of those details but there you have it. I purchased it at Nordstrom around February 4th and our retreat started on the 6th! The cardigan of course is Chico’s. Jeans are by AG, sandals are Campers, my new favorite comfort sandal. Those little ribbons in the shoulder seams have photobombed my drivers license picture. I remove them a lot sooner now! Speaking of unnecessary threads: has anyone heard that those tiny loops of thread at dress waistbands are NOT belt loops but are there to keep the belt with the dress? And that they are to be removed as quickly and for the same reasons mentioned by T J Starr? Yes? No? Okay, I am happy to hear about the belt look thingys. I rarely encourage my clients to wear the self belts so I’m always cutting them off but now I won’t feel nervous about it at all. I’m learning something new today! That’s pretty funny about the ribbons photo bombing your driver’s license picture! It’s like it’s in cement for as long as they keep those pictures without changing them! Great idea. I’ve removed labels for a long time, but I haven’t kept them. I’ve been laundering for so many years I don’t get things wrong very often. And as for shoulder loops, I cut them out as long as the item doesn’t have any elasticity. If it’s a stretch item I use the loops to wrap around the neck of the hanger so all the weight pressure is on them, not in the shoulders of the garment. That trick has saved me a lot of mis-shaping anguish. Very good point, Laurice, about protecting shoulders. I did get it wrong once with a long peasant style skirt. After laundering it it came out about six inches shorter. I must have put it in the dryer as well. I regretted that one a lot! Cutting off labels helped me once to save a lot of money: browsing a second-hand-shop in holiday at the Bodensee I saw a wonderful red (Ellen-Barkin-style “Sea of Love”) biker jacket in tremendously soft leather. The shop-girl said “It’s surely a designer piece, but as the label has been cut out, I can’t sell it but for 60€…” Bless you, dear label-ripper whereever you are!!! Oh my gosh, what a winner! I remember that movie, Ellen Barkin, and that biker jacket!!!! What a score! And please please can someone tell men that the labels on their jackets sleeves are only there for info when they’re hanging, and not to be left on when worn! Okay, Mariam, I think I have another tip for men. I was at a festival and a man had jeans on that had the tape that runs the full length of the jean announcing 32Long a bazillion times. I didn’t know what to do. He was walking with his wife, apparently so I did nothing. Was that wrong? Perhaps you could hole-punch the hang tag and put the hang tag over the hook of the hanger? That way the tags are all with the garment (and can be sewn back in when consigning). NEXT you will have SPOT on the evening NEWS!!!!!!!!!!! Not such a BAD IDEA!FUN GOOD NEWS FROM YOU each and every DAY! Oh my gosh, I’d LOVE it!! 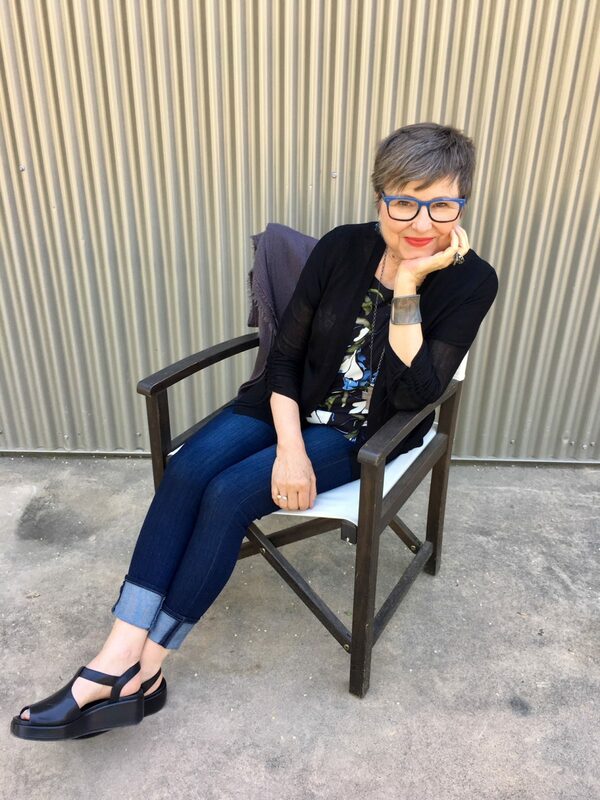 I can hear it: Coming up next, Brenda Kinsel with her Why Not Beauty Report from Sonoma. My mom is a label remover too (although I don’t think she keeps them like this). It’s such a smart idea, so now I want to pick your brain. Do you remove them on scarves too?? I’m never sure if it’s good to keep them there and just try to hide them or remove them? This is addressed in one of the numerous posts above. I’ve had to eat with this, too. Excellent question, Jodie. I always remove them. My clients love when I pull out my seam ripper and take those labels off scarves. It’s a headache to try to hide them and they certainly disrupt the beauty of the scarf! Yes, labels on scarves are big offenders in my eyes. It’s something I will notice on strangers passing by and I just want to stop and pull out my tool and preform a public service. Was I put on earth for that? Maybe! Thanks for your question, Jodie!